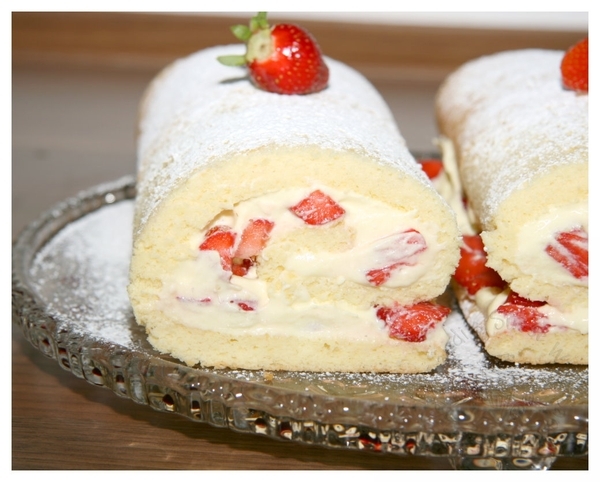 You are here: Home » Food Drink » German Strawberry-Cream Roll. Line a rimmed cookie sheet (15″ X 10″) with parchment paper. In a small bowl, mix together flour, corn starch, and baking powder. Whip egg whites with 3 tbsp. water until stiff. Slowly whip in 1/2 cup sugar. Stir in egg yolks. Fold in flour mixture. Bake 8 – 10 minutes until wooden pick inserted in centre comes out clean. Beat whipping cream and icing sugar until stiff. Unroll cooled cake. (Brush with jam if desired – see note above). Sprinkle with additional icing sugar.